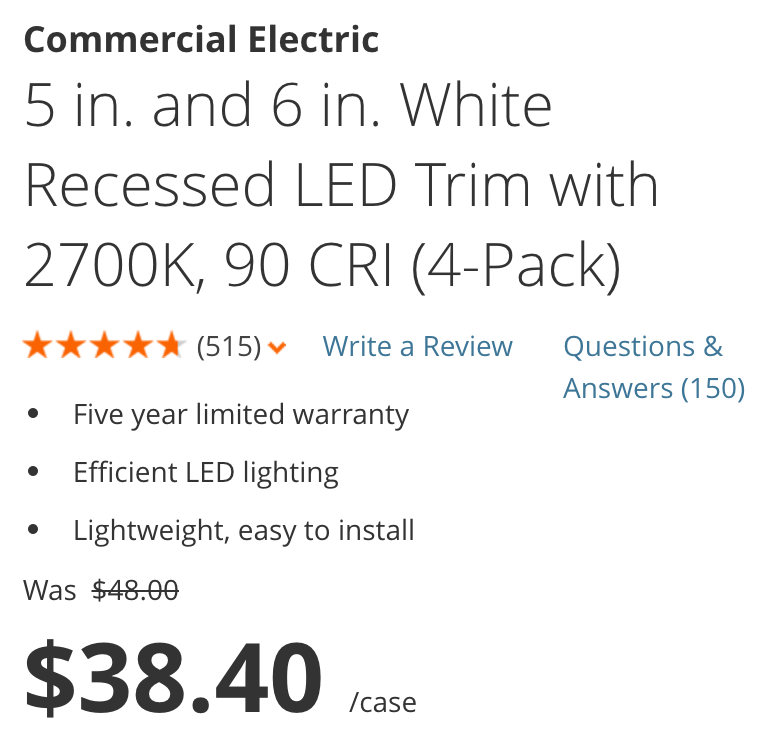 Home Depot offers a 4-pack of Commercial Electric 5/6-inch Recessed LED Lights for $38.40 shipped. That’s down $10 from the regular going rate and the best offer that we can find. Making the switch to recessed LED lights brings a number of advantages, including less energy use. A five-year warranty included with purchase. Rated 4.6/5 stars by 515 Home Depot customers. The Commercial Electric 5 in. and 6 in. Recessed LED Trim with clean and elegant design is ideal for glare-free lighting in any room of the house. This ETL classified high efficiency dimmable trim has received Energy Star Certification for year-round energy savings. It’s compatible with a dimmer switch for different illumination needs and increased energy saving. This LED Trim is for use with 5 in. and 6 in. IC and Non-IC recessed housings and will retrofit 5 in. and 6 in. incandescent housings to energy saving LED down lights. Reduce energy consumption to 11-Watt LED – comparable to BR30/65-Watt incandescent bulb. Rated for wet locations, it is usable for shower and exterior applications.